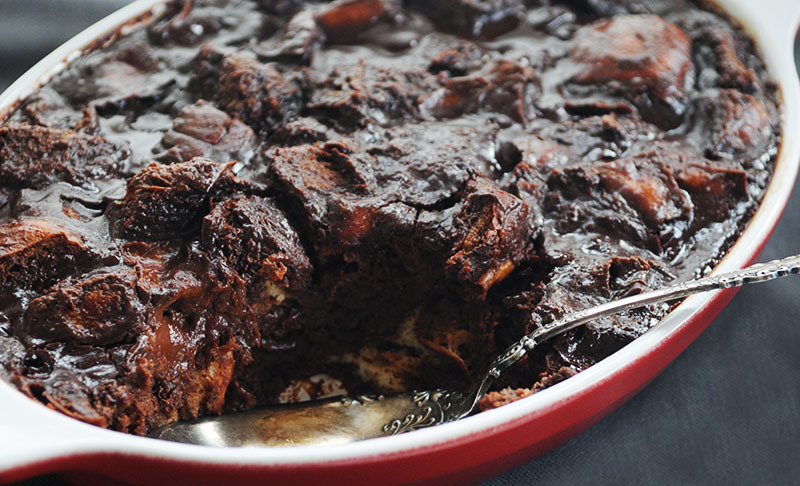 It’s getting colder outside and you need a dessert like this chocolate bread pudding in your repertoire for the upcoming months. Go ahead, you know you want this. I don’t think there’s anything more I can add. In a medium saucepan, combine the heavy cream with the milk and vanilla bean and bring just to a boil over moderately high heat. Remove from the heat and let stand for 5 minutes. Discard the vanilla bean and bring the cream mixture just to a boil. Remove from the heat and add the finely chopped chocolate. Let stand for 2 minutes, then whisk until smooth. In a large bowl, beat the egg yolks with the sugar and salt. Very gradually whisk in the hot cream mixture until smooth. In another large bowl, toss the brioche with half of the chocolate cream and the chocolate chips. Spread the soaked bread in a 9-by-13-inch baking dish and then pour the remaining chocolate cream on top. Cover with plastic wrap and let stand at room temperature for 30 minutes. Preheat the oven to 325°. Bake the bread pudding for 35 to 40 minutes, until the top is glossy and the center is set. Let stand for 15 minutes. Serve the bread pudding warm with crème fraiche.